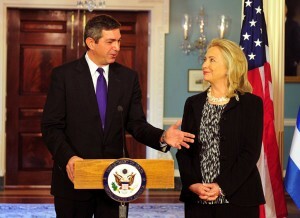 The relation between the US and Greece “is solid”, US Secretary of State Hillary Clinton said here on Thursday while welcoming visiting Greek Foreign Minister Stavros Lambrinidis for talks at the State Department. In statements after meeting Stavros Lambrinidis said the talks were “extremely positive” and that Athens and Washington now had a “common approach on many issues”. He said the meeting had allowed him to brief Clinton in depth on the recent decisions taken by European Union leader concerning Greece’s debt, stressing that these would give the country breathing space in order to make the necessary changes, and emphasising Washington’s contribution to this decision. The meeting also covered regional issues, such as Turkey and Cyprus and the Balkans, where Lambrinidis thanked Clinton for the steadfast stance of the U.S. with respect to oil drilling by the Cyprus Republic. On the Macedonia name dispute, the minister stressed Athens’ concern over a perceived hardening of Skopje’s stance on the issue, which showed it did not share Greece’s desire to find a solution to the problem. Regarding the upcoming talks on the Cyprus issue at the United Nations, Lambrinidis said that both sides supported the talks and considered it important that there be a successful outcome. Speaking at a joint press conference and referring to the current economic crisis, Clinton said that her country hails Greece’s commitment for “fiscal and structural reforms” and termed as a positive development an EU Summit decision in Brussels on Thursday morning. Lamprinidis on his part pointed to the “positive role” played by Washington adding that “things went well” for Greece. Clinton also referred to the “long standing alliance” between the US and Greece, noting that the two countries share “common targets” as regards stability and welfare in Southeastern Europe, North Africa and the Middle East. “The United States are looking forward to the widening, deepening and reinforcement of this relation of vital importance,” she added. Lamprinidis, on his part, underlined the “extremely important and useful role” played by the US and Hillary Clinton, especially during “these past difficult” months. “It is a great pleasure to welcome Foreign Minister of Greece here today. I have appreciated the opportunity to work with him and I had several occasions including in Athens to discuss not only our bilateral relationship, which continues to be strong and very consequential to us both, but also regional and international matters, and of course the international economic challenges that Greece along with the rest of the world is facing. Tomorrow marks the 71st anniversary of OXI Day, when Greeks celebrate the freedom and courage of the Greek people, and Greece today is being asked to summon its courage again. This time the challenge is economic. The Greek people are making major changes, big sacrifices, to return their country to financial health and economic competitiveness. And while those changes and sacrifices are certainly painful, they are necessary. And in the long run they will benefit Greece and its partners, but most particularly the children and future generations of Greek citizens. United States applauds Greece’s commitment to fiscal and structural reform. Decisive actions in the EU are also critical to resolving the European economic crisis and Greece’s crisis in particular. Early this morning in Brussels European leaders made vital decisions to address the significant and pressing economic challenges they face. Greece is a long standing ally of the United States. 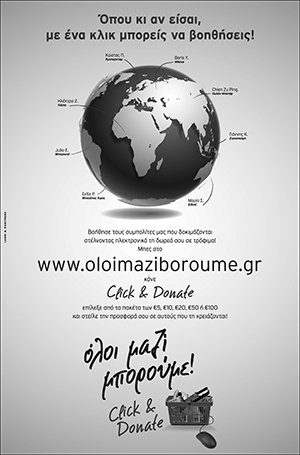 In ways large and small, life in our country is enriched by the energy and contributions of our many Greek-Americans. And abroad Greece and the United States share common goals for stability and prosperity in Southeastern Europe, North Africa and the Middle East. The United States looks forward to broadening, deepening and strengthening this already very vital relationship. Stavros, thank you so much for being here. Now this is a wonderful occasion for me to be here and have a chance to talk to the Secretary of State of the US on a number of very important issues, for bilateral relations, but also for Europe. Yesterday, a new leaf was turned in Europe, and I think a number of hopeful days are ahead of us, for Greece and for Europe and for the United States, as indeed our economies and our fates in many ways in this world are tied together. I think it is imperative for me to underline the extremely important and helpful role the US has played, and Hillary Clinton in particular, throughout these difficult months. It is often said that friendships get tried during difficult times, and these are indeed “OXI Days” as you mentioned. Greece and the United States do know of difficulties. We have been together, stood by each other, during difficult wars, and we are standing by each other today, as well. I think I will have a wonderful opportunity to discuss issues in our neighborhood and in our region that concern us both deeply, in which Greece has a very active involvement and a great desire to be able, together with the EU and the US, to bring peace and stability that we all need. So thank you very much for this opportunity to see you again after only a few months. When you came to Greece the first time, I told you that you were my first foreign visitor, and I wished that you would bring me luck. I can say that now things have gone well for my country. The difficulties are there. As you mentioned the Greek people are making a tremendous amount of sacrifices. I am grateful that you as well have been able to recognize them. We know we have tough days ahead of us. We are changing our country, and Europe is indicating that it doesn’t only have the ability, but also the will to stand by us and to stand by the EU project. Thank you. Previous article "Transition to Christianity": Art of Late Antiquity 3rd to 7th Century A.D.
Greece has sold their sovereignty, which they should not blame the current government for because it was the corrupt Greek population who did not care less about future generations. We all know this!